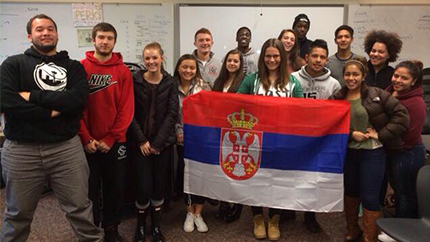 Serbian exchange student Dunja Paunovic poses with the Serbian flag and her new friends at her host school in Seattle, Washington. Dunja, a CIEE American-Serbia and Montenegro Youth Leadership Exchange (A-SMYLE) program participant from Serbia, fully embraces new experiences and opportunities to learn and have fun. Dunja and her host sister both volunteer at the Seattle Public Library where they participate in projects organized by the library, such as making finger puppets for hospitalized children and helping to repair and mend damaged books. In her host school, Dunja is a member of the Food Education Empowerment and Sustainability Team (FEEST), a youth-led improvisational dinner program that engages young people in issues of civic and social justice, cultural expression, and community development; and College Access Now (CAN), which prepares students to make decisions about higher education. Dunja said she enjoys learning about American culture and introducing herself and her home country to Americans. During presentations about Serbia, she exhibits the Serbian flag, money, national dress, and figurines of a man and woman wearing traditional outfits. Dunja receives a lot of questions from the audience, which she is happy to answer. “They asked me to compare life in America and Serbia, about our religion and language, the A-SMYLE program, and my plans for the future." Highlights of the presentations that surprise and delight her audience are slide shows of their names written in the Cyrillic alphabet and her challenging them to try some tongue twisters in Serbian.